It’s my new favorite hobby. Right now, I have destroyed five seasons of Dr. Who. I thought that was pretty impressive, but then I realized I still haven’t started Breaking Bad or Sherlock. This brings me to my point: TV Binging. With the ease of programs like Netflix and HBO Go, all I need is a few hours to devour an entire television series. I love it! I once related to how we read books. We don’t wait a week in between chapters (unless you’re a really slow reader like myself), we read a book in the matter of one or two weeks. We don’t have to wait. The entire story is there at our fingertips. One show that I absolutely have to catch up on is Boardwalk Empire. I’m not entirely sure where it’s going this season, and I have to say, I’m not sure that I like that. But moreover, I’ve been a huge fan of the show since day one – so I can’t give up on it now. The fact that Margaret isn’t a huge part of the show is probably what bothers me the most. When it comes down to it, any television show or movie is about the relationships. Take any show you’ve ever watched…the surroundings are secondary. In Dr. Who, sure the sci-fi effects are cool. Everyone loves a good time machine! But think about it. The relationship between the Dr. and his companions is what drives the show. Ever seen Silence of the Lambs? Jody Foster is running around trying to catch a serial killer with the help of another serial killer. First of all, fantastic movie. Anthony Hopkins kills it. The problem is, many people think the movie is about psychotic sexually-confused murderers. It’s now. The movie is about a young woman’s journey to prove herself as a policeman. The relationship she shares with the chief and Hannibal Lecter is what makes it wonderful. And I feel like Boardwalk has taken the big one from me – Margaret and Nucky. Which is so sad! I love the two of them together. I really wanted some sort of Bonnie and Clyde ‘esque romance to happen there. Of course, it did not. Margaret went for another guy (by the way, wonderful romance there). But now she’s nowhere to be found, period. In reality, it makes a certain amount of sense. Why wouldn’t she leave a power-hungry gangster? But you can’t help but feel for Nucky. He’s the Walter White of 1920’s Atlantic City. That being said, the time jump may also have me confused. After the time jump in True Blood, I remember being mad for weeks. I always feel like I’ve missed out on something huge! Believe it or not, time frame has a lot to do with a story, and jumping forward a few years can really take the viewer out of it. Anyway, that’s my spill for today. I’m going to go catch up on some Boardwalk Empire. If you have never seen it, please do. It’s a great example of how cinematic and beautiful modern television can be. 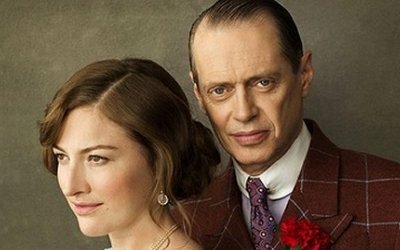 Oh, and Margaret and Nucky will be there for you to swoon over. You’re welcome.